Papers: ca. 1966-1978, 160 cubic feet. The papers of Philip Edward Ruppe contain congressional papers and correspondence, including motion picture film and memorabilia. A finding aid is available in the repository and online. Videocassettes: 1982, 17 commercials on 3 videocassettes. 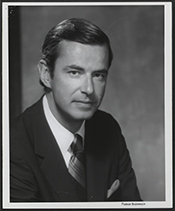 The commercials were used during Philip Ruppes 1982 U. S. Senate campaign in Michigan, Republican Party.